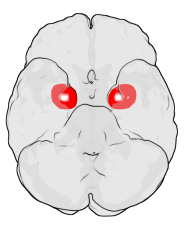 Location of the amygdala in the human brain. Image: Wikipedia. "The amygdala is a unique brain structure in that it grows dramatically during adolescence, longer than other brain regions, as we become more socially and emotionally mature," said Cynthia Schumann, associate professor in the Department of Psychiatry and Behavioral Sciences at the UC Davis MIND Institute and senior author of the paper. "Any deviation from this normal path of development can profoundly influence human behavior. "To understand what cellular factors underlie amygdala development, the team studied 52 postmortem human brains, both neurotypical and ASD, ranging from 2 to 48 years of age.